Hotel Valea cu Pesti 4* (Fish Valley Hotel) is locaetd at 38 km away from Curtea de Arges, on a hill near the Transfagarasan Road, on the eastern border of Vidraru Lake, at an altitude of 870 m high. To get to Hotel Valea cu Pesti, one must follow the national road DN – 7C – the Transfagarasan, road which passes through some villages such as Albesti, Corbeni and Capataneni. In Capatanani, before entering the Arges River Gorges, one can visit a memorial house which belonged to the Romanian classic music composer George Stefanescu (1843 – 1925). He was an important figure of the classic Romanian music, the author of the first Romanian symphony and the founder of some lirical societies precoursory of the Romanian Opera. Moreover, here came to visit the composer, some other important figures of the Romanian culture, such as: the poet Vasile Alecsandri, the writers B.P. Hasdeu, I.L. Caragiale, Constantin Nottara, the doctor Carol Davila and others. Their names are written on a board at the entrance of the house. In this memorial house, besides the documents and the objects that belonged to the musician and besides a collection of historical and popular art objects, there is also the piano that George Stefanescu used to accopany the well known opera singer Hariclea Darclée. Also in this house, the writer I.L. Caragiale wrote the novel „Napasta” ( The Injustice) . The friends of the writer I.L. Caragiale said that the idea of this novel came to him after he met a very beautiful girl in a tavern near Capataneni. When he was about to leave the tavern, being amazed by the beauty of that girl, a local boy told him that „ Hey, master, for this girl somebody will die”. From these words came the idea of a rural drama and so the novel „Napasta” („The Injustice”) came to light. the buildings that used to form the royal court ensemble are today ruined till the foundations. From the Basarab I time it can still be seen the royal house cellar on the south side, built around 1340 and the church that in 1352 was finished in red. Arges Station or Royal Station, as it is called, was built time of Carol I. This station is worth adding to the list of sightseeing and of utmost importance in Arges Romania, being a building with strong historical connotations. Royal Station called because all the kings buried at the Monastery of Curtea de Arges were brought by train. The hall-of-station-yard argesasteptare the past and last voyage station of King Charles I, in 1914, brought to the monastery for burial. located at 30 km away from Curtea de Arges, it is a giant construction. 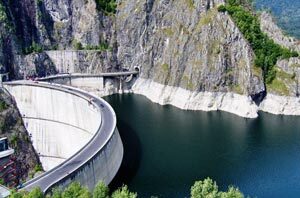 At the time of its building, Vidraru Dam was the first one of this type in Romania, the 6th in Europe and the 9th in the world as height. It forms the Vidraru Lake. 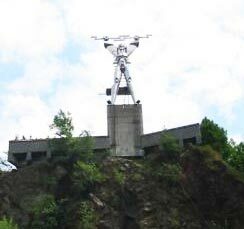 a giant Prometheus, made by the sculptor Constantin Popovici, it is located near the Vidraru Dam, on top of a prismatic tower, covered in green mosaic and it is surrounded by a stairway that goes till the highest platform. From here you have a splendid view over the Vidraru Lake until the peaks of Fagaras Mountains. the highest road in Romania, built between 1970 – 1974, is located at 2055 m height and crosses the Fagaras Mountains through a 850 m long tunnel. 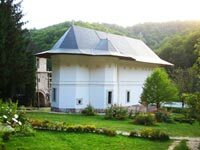 is located in Musetesti village, at 20 km away from Curtea de Arges, in the middle of the forest. It was first built of wood and then, during Matei Basarab’s reign in 1644, it was remade of stone and brick. The painting has been redone or replaced several times. In this hermitage at first lived monks, but today it is a nuns hermitage. Today there live 30 nuns. Musetesti etnography museumis located in Musetesti village, at 15 km away from Curtea de Arges. In the two halls of the museum we can see pieces that impress us through their authenticity: clothing pieces, tools, ceramics, materials and documents that used to belong to the first printer from this area. 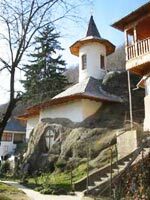 located in Corbi village, at 30 km away from Curtea de Arges, it is dug in a rock on the left side of Lady River and it was built in the XIVth-XVth centuries. To get into the church you must go now through the porch dug in 1814, on the south of the naos. The fresco painting is considered to be the oldest in the Romanian Country. 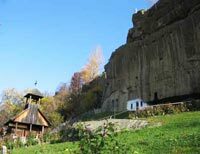 located at 40 km away from Curtea de Arges, in Namaiesti Village, is a religious monument about which building there are not known the exact dates and whose church is dug in the rock. It is told that the church is a Christian catacomb from the roman period. The tradition associates the beginnings of the monastery with the discovery in a cave of a Virgin Mary miracle worker icon (one of the 12 wooden icons with the real face of Virgin Mary painted by the Saint Luca for each of the 12 apostles) during the Negru Voda reign. is a valuable ensemble in Brancoveanu style architecture ensemble with paintings from 1730. Near the church are still kept the inside, the cells and the steeple tower. 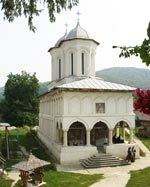 is located in Aninoasa village, at 24 km west away from Campulung and 34 km east away from Curtea de Arges. The church was built in the XVIIth century, but ruined in 1871. It was rebuilt on the same place as the old one in 1992.